Qiushi Chen, assistant professor of industrial and manufacturing engineering, teaches students how to utilize engineering tools in the health care industry in his health care systems engineering class. UNIVERSITY PARK, Pa. — Systematic thinking, quantitative modeling, Big Data analysis. These are a few skills that set Penn State industrial engineering (IE) graduates apart from their competitors entering the United States job market. Currently, there is a specific need for this data-driven mindset in the health care industry. Faculty members in the Penn State Department of Industrial and Manufacturing Engineering research real-world health care problems that have a practical impact on clinicians and health policy makers. 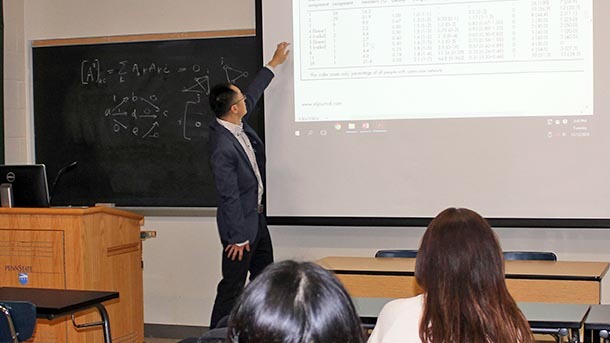 One such researcher, Qiushi Chen, assistant professor of industrial and manufacturing engineering, teaches IE graduate students how to apply skills they’ve learned to opportunities in the health care field. Chen recently began a collaboration with Penn State Milton S. Hershey Medical Center doctors, psychiatrists and Big Data scientists working with the data available for adolescent autism disorder. The goal is to develop mathematical simulation models in order to identify the most effective intervention strategies for vulnerable cohorts and reduce the large number of emergency room visits typical for this population. Today, policy decisions are driven by the quantitative analysis of evidence and data. Industrial engineers possess the systematic thinking necessary to build models that address questions formerly unsolvable through observational studies. Chen is working with Penn State professors in both criminology and health policy administration on a study addressing the opioid crisis in Pennsylvania. By combining health care data such as overdose deaths and emergency room visits with criminal data, the group hopes to explore the geospatial-temporal trends in opioid use. Doing so will enable decision makers to appropriately allocate resources in the future. Joel Segel, assistant professor of health policy and administration in the Penn State College of Health and Human Development, believes engineers and health policy administrators are natural collaborators. At Penn State, the Service Enterprise Engineering (SEE) 360 strives to inform students of the demand for engineers in health care and other service industries in order to prepare IE graduates for today’s job market. An SEE minor is available to undergraduates and is especially appropriate for health policy administration majors interested in work similar to Chen’s. As an SEE 360 supported faculty member, Chen will explore impactful research questions on health policy topics such as multi-intervention resource allocation to address public health problems. He will also focus on personalized clinical decision problems for individual patients. Chen is enthusiastic about passing his knowledge and expertise on to both undergraduate and graduate students. Through developing and teaching health care engineering courses, Chen has increased students’ exposures and fostered interest in the field. There are several health care areas that industrial engineers can contribute to with their training background and expertise, according to Chen. His interests primarily lie in health policy modeling and health outcomes research. Christopher DeFlitch, chief medical information officer at the Penn State Hershey Medical Center, is a member of the SEE 360 Advisory Board and a board member for the Penn State Center for Healthcare Organizational Transformation (CHOT). He emphasized the opportunity and need for IEs in hospital delivery systems and operations management at a recent SEE 360 panel discussion. Health analytics is another area in need of engineers, as the variety and massive amounts of data being collected today can be utilized to improve decisions for patients, providers and payers. Chen encourages industrial engineers to reflect on what they are most interested in and motivated by. Chen has published many papers focused on the cost-effectiveness of various interventions including screening policies and treatment strategies for diseases like liver cancer, colorectal cancer, leukemia, lymphoma and hepatitis C. His past research involves clinical decision making, infectious disease prevention and control, health economic evaluation, population health policy analysis and health service operations. To learn more about Chen’s research, visit his website at sites.google.com/site/qiushichen16. For more information or to learn how to become involved with SEE 360, contact Bárbara Venegas at 814-863-5742 or bbv105@psu.edu. Updates from the Service Enterprise Engineering 360 Initiative are available online at see360.psu.edu. 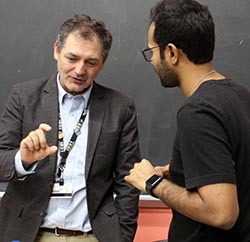 Christopher DeFlitch, chief medical information officer at Penn State Hershey Medical Center, speaks with a student following a recent SEE 360 Advisory Board panel discussion.